Allow me a moment of shameless self-promotion. Actually, it’s more a moment of other-people promotion, because the thing I will eventually get around to talking about here was a total surprise to me. Isn’t that cool? You can all applaud the folks at Quick Fictions, because I had nothing to do with it. But I like it very much. I haven’t blogged in a while. Long enough my faithful readers have gotten through the DT’s and moved on to something better. Maybe videos of cute cats. But the rest of you, the sporadic dabblers, the opportunistic feasters, the ones who catch the friendly moth as it flies in its erratic dashes towards porch lights and candle flames — look, you’re still here. That’s cool. Thank you. Blame writers for me not writing. There were thousands of them. The hallways were like an airport. I did not make that up; I stole it from another writer*. Writers steal words. It’s true. Imitation is for the weak at heart. Full scale plagiarism is for people who let google do their work. If I sound wacky, it is because I am very tired. Not tired of writers, but tired of airports, real and stolen. I will tell you what I am talking about. Three little letters: AWP. This stands for eleven thousand writers boozing and shmoozing and handing each other free poetry in some cold, offseason city. This time it was Boston. AWP is the place you meet your ex-professor’s mother. It is where forty people cram into a 23rd floor hotel room at ten PM on a Friday night and your friend reads them poetry until someone calls security. It is the kind of place where hungover people squeeze on a classroom floor at ten AM the next morning to hear people talk about novel structure and three year olds ordering Chinese food. It is the only place I have ever seen writers shell out eleven bucks for a glass of wine. Cheryl Strayed is the queen of that place, as she should be, and so are a bunch of poets whose names I don’t know, as I must assume they should be. There are panels and readings, if you want them. But mostly, there are writers, streaming up and down elevators and stinking up the entryway with their archaic cigarettes. And these writers? They aren’t writing. They are talking to each other. It’s great. *Ken White. He’s a poet with a book you can buy and some serious wit that you can’t. You can only steal it. Did you go to college or live in a house with too many friends or burn with simultaneous idealism and confusion or put cumin in everything or hate war or love bicycles? Then maybe you should check out my piece, Like a Spark to Darkness, in the Atticus Review. It’s an excerpt of my novel, GOOD LIKE THE SEA. It’s short. Read it. Don’t tell the Californians, but it has been sunny in Seattle. We have had a week — more! — of pure sun, broken only by atmospheric fog. Vitamin D is in the very air. This is the week in January that keeps the whole Northwest from going postal. Not only has it been sunny, it’s been cold. We’ve had frost. We’ve had ice. And, in the words of an infinitely quotable five year old, “if it rains it will snow.” Give that one to the Zen masters. Squinchy knows how to enjoy the world. He rolls on the frozen puddle in the vacant lot like it is a ripe dead salmon. 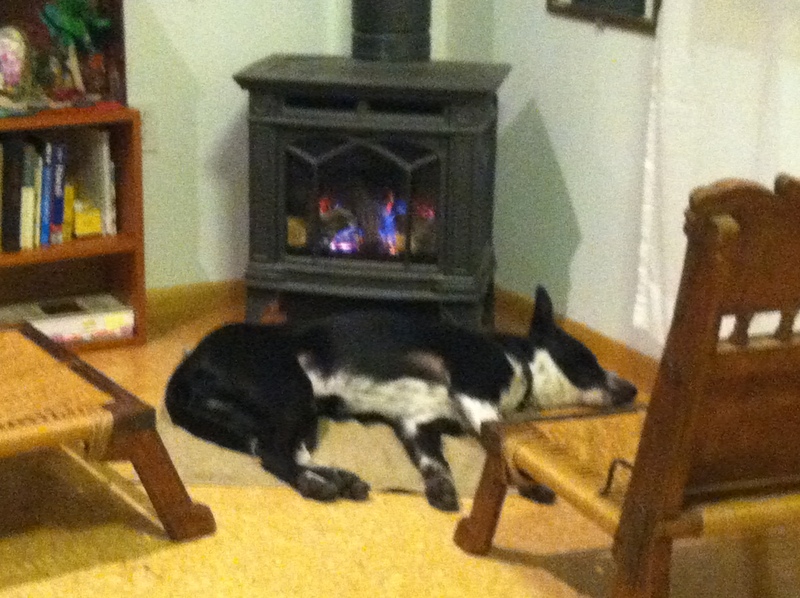 He sleeps by every fire. If you are needing any help making the most of winter, curl up somewhere cozy and listen to me read you a story. It will only take a minute and fourteen seconds. If that’s not enough, click on some of the other ones. I can promise you British accents. But don’t do this during the daylight. Get out into the sunlight, if you have it. We want you to stay sane.